Matraville’s Themalis (Tim) Macarounas had only served as a police officer for a few months before he was killed on duty. Five months after the 22-year-old graduated, he was driving in a pursuit of a stolen car along Oxford St when his wheels locked after braking and crashed into a light pole. He died from his injuries on October 20, 1987. Constable Macarounas is one of 31 names engraved on a new memorial at the Eastern Suburbs Memorial Park honouring officers killed on duty and resting in the park from the Eastern Beaches, Eastern Suburbs, Waverley and Rose Bay Local Area Commands — including four colonial officers. 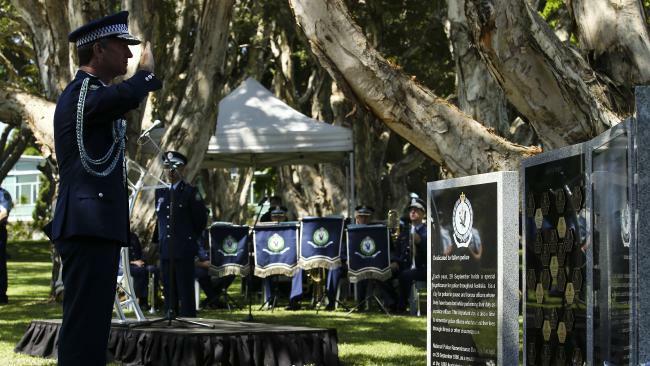 NSW Police Commissioner Andrew Scipione unveiled the memorial during a ceremony on Monday. Constable Macarounas’ parents, Helen and Arthur were at the service. The couple visit their son’s grave every couple of weeks. They said their son was a talented athlete — he played many sports and represented the South Sydney district in the Harold Matthews Shield and SG Ball rugby league teams — but he was too short to enter the police force straight out of school. It wasn’t until height restrictions were abandoned, that he was able to tryout. “We were so proud of him when he graduated,” Mr Macarounas said. Constable Macarounas’ funeral was attended by 600 mourners. “He was everything to us. Not only to us but to his friends,” Mrs Macarounas said. The Local Police Memorial is the second of its kind in the state. Woronora Memorial Park, Sutherland, had one installed in April. NSW Police Commissioner Andrew Scipione said the memorial would “stand as a beacon of hope, a beacon of sacrifice and commitment, from the police force to the community”. NSW Police Commissioner Andrew Scipione has officially dedicated a new memorial honouring fallen officers in the Eastern Suburbs of Sydney this afternoon. The Commissioner was joined by local police, families, friends, and colleagues, for the dedication of the NSW Police Memorial, led by Police Chaplain, Father Paul O’Donoghue, at Eastern Suburbs Memorial Park today (Monday 30 November 2015). The memorial honours 31 NSW Police officers who were killed on duty within the Eastern Suburbs, Eastern Beaches, Botany Bay and Rose Bay Local Area Commands, or who were cremated or laid to rest at Eastern Suburbs Memorial Park. Commissioner Scipione said the plaques and memorial wall are a wonderful way to honour local officers who have made the ultimate sacrifice. 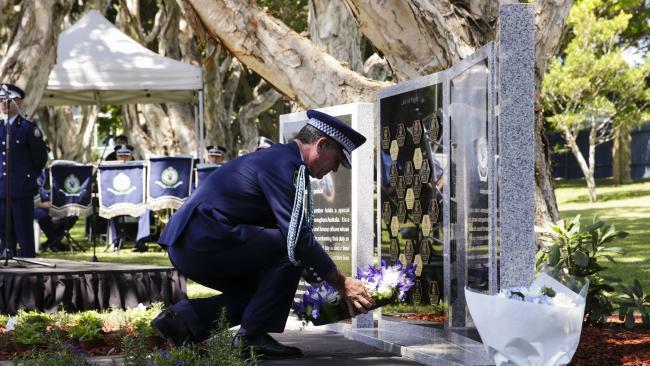 “The NSW Police Memorial at Eastern Suburbs Memorial Park gives family, friends, colleagues and members of the public a place to come and reflect on the lives and achievements of the officers who died while serving the community,” Commissioner Scipione said. “The men and women of the NSW Police Force serve the community each day – all the while not knowing what potential adversity they may face yet understanding they may have to risk their own life to save another. The names of the 27 local fallen officers, who died on duty since 1862, are inscribed on the wall of the memorial. An additional four colonial police, killed prior to the inception of the NSW Police Force, will also be remembered in the form of separate plaques within the memorial garden. The NSW Police Memorial is a joint project of the Southern Metropolitan Cemeteries Trust and the NSW Police Force.